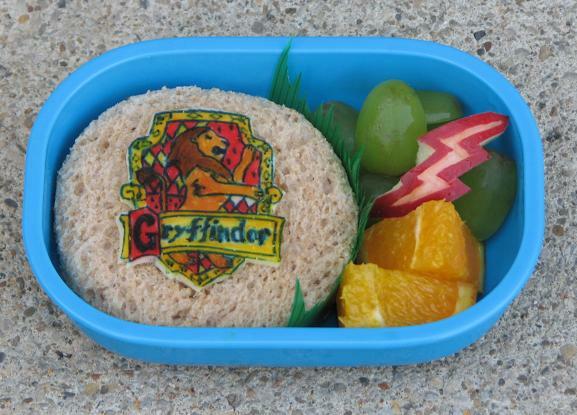 Bento for Kidlet: Go Go Gryffindor! Harry Potter is another one of those nerdy things the Kidlet and I love! He asked me if I could do Slytherin tomorrow....heh. Gryffindor symbol made from cheese and food color markers on top of a soy ham sandwich. On the side are grapes, oranges, and an apple lightening bolt. Wicked! I'm definitly going to do a Harry Potter bento soon too! Very impressive! I especially love the lightening bolt! You really impress me with the apple shapes. I always look forward to what you'll come up with next.